The TreadRight Foundation, a joint initiative between The Travel Corporation’s (TTC) family of brands, has partnered with leading active conservation organizations Cheetah Outreach and The Cape Leopard Trust to ensure local communities can protect themselves and their livestock from a top predator responsibly and sustainably, while also helping protect one of Africa’s most endangered wild animals. The Cape Leopard is one of the few predators at Bushmans Kloof Wilderness Reserve & Wellness Retreat and its surrounding region in the Cederberg Mountains of South Africa. As local human populations have grown, so too have the number of encounters and conflicts between the rare Cape Leopards, people and their livestock. This has led to an increase in instances of Cape Leopards attacking domestic livestock over the past several decades, risking not only depletion of essential domestic animal populations, but also significant, irrecoverable damage to economic and social well-being of local communities. Consequentially, this has caused there to be a sharp increase in the number of Cape Leopards killed by farmers. Recognizing the need to urgently address the crises, Bushmans Kloof and TreadRight, working with neighbouring farmers, has led the way in finding and funding a natural resolution. Partnering with Cheetah Outreach and The Cape Leopard Trust to adopt and adapt community protection and predator management solutions, with the support of TreadRight, three Anatolian Shepherd dogs have come to Bushmans Kloof as livestock guardian dogs (LGDs) with more to follow. Originating in the hills of central Turkey, for generations these animals have used their strong and sturdy anatomy, sharp eyesight and hearing, and exceptional speed and agility, to protect vulnerable livestock at risk of becoming prey to local predators. Born and bred guardians, the Anatolian Shepherds offer a perfect strengthening of solution for Bushmans Kloof and the surrounding region. 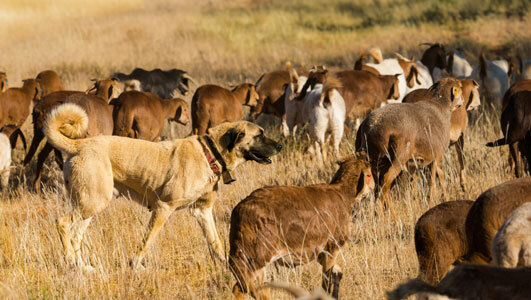 The TreadRight Foundation is supporting the placement of the Anatolian Shepherds with local farmers, providing the cost of raising the dogs through their first year. The dogs are regularly monitored by Cheetah Outreach to oversee proper training and help ensure the dogs reach their full potential as an LGD.